Sri Rama. The very mention of this name brings to our mind the image of the Sri Rama who was the embodiment of all perfection. We must have seen many persons ideal in their respective fields of work or in a particular role of human relationships. 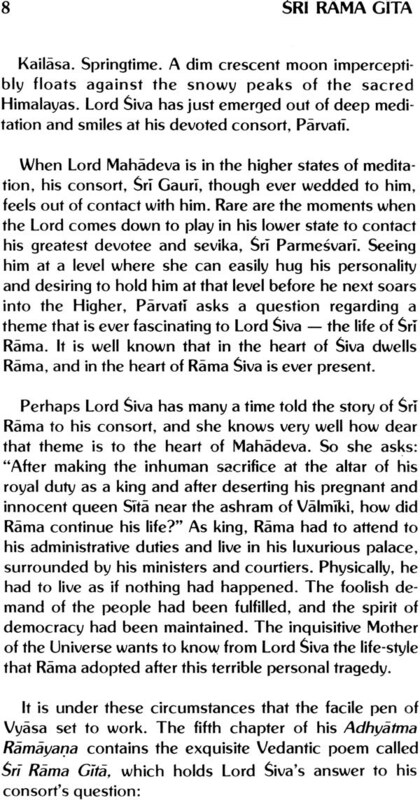 Sri Rama was the perfect ideal in each and every respect. He was an ideal son, husband, and disciple, ideal brother and friend, but his role as a spiritual teacher is not as well known as Sri Krsna's is through his Bhagavad Gita addressed to Arjuna. 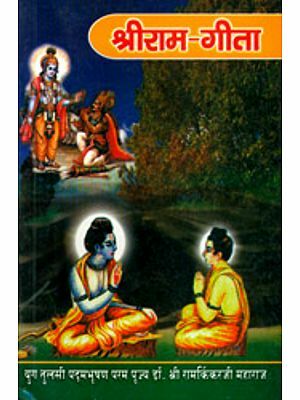 Here, in Sri Rama Gita, found in the Uttarakanda of Adhyatma Ramayana, we meet Sri Rama in the role of an ideal teacher dispelling the ignorance of his most devoted and dear brother Laksmana by imparting the knowledge of the Self. The subject is subtle, and the exposition by Sri Rama is brief but fully comprehensive. 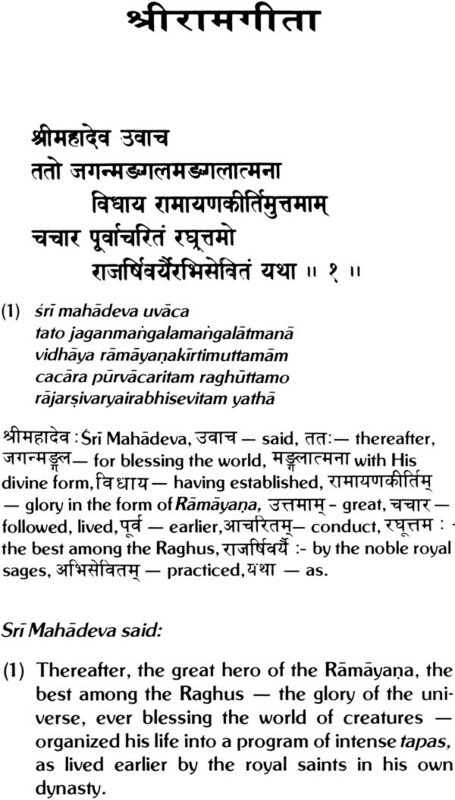 This text seems to have inspired even Bhagavan Sankaracarya, as we find many similar verses in his Atma Bodha. 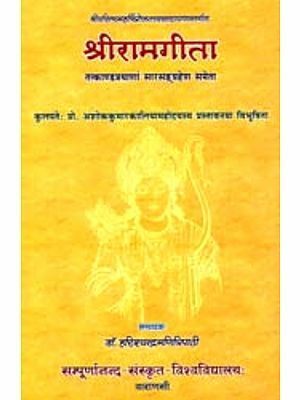 Gosvami Tulsidas has also given Sri Rama Gita in the Aranyakanda of his famous work Sri Ramacaritamanas. His source of inspiration is this Gita alone. 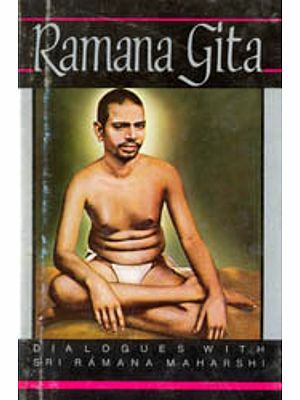 In this book, Pujya Gurudev provides insightful notes for the student of Sri Rama Gita, revealing the deep significance of each verse in an effective and enchanting manner. I feel greatly honored and privileged to have been asked by him to add a few words as a preface. How shall I express my gratitude to him? Words really fail. May his blessings be ever with me! Head bent low in deep thoughts, he was walking up and down the length of the carpeted hall. There was an unusual silence in the place that morning. The birds sat brooding, totally forgetting to chirrup their gleeful welcome to the clear down. King Ramacandraji was lost in his thoughts. The conflict within him was becoming unbearable: his love and his duty, his personal just opinion and the unjust criticism of the public were tearing his asunder. He knew that his consort, dear Sita, was the most chaste, honest, and loving wife, but his subjects had questioned Sita's moral purity. He had to remember that Sita was not only his consort but also the queen of his subjects in Ayodhya. As king he had to fulfill the wishes of his subjects. As husband he wanted Sita to be with him, after all the many years of their exile and Sita's extreme sufferings in the Asoka Forest of Lanka. But he was the king. As king he was the servant of his subjects and was duty-bound to submit to the wishes of the people of his land. Time stood still. In the restless sorrows of indecision, the man in him did not clearly know the duty of the king in him. He paused at the open window, watching the sunrise. Then suddenly he bristled into a decision. His heart was throbbing with sorrow, but his head was cool and determined. A king had to make sacrifices in order to rule effectively and administer law and justice. "Who's there?" he thundered. The soldier outside the door respectfully entered the royal hall. Saluted, and stood at attention. Sri Ramacandraji took a long breath. Cleared his throat, and said, "Go and inform Laksmana that I want him here immediately." The soldier bowed and, walking backwards, left the rook quietly. Sri Rama started walking up and down in determined steps. Slightly panting in his hurry, Laksmana walked into the presence of his devoted brother and bowed down in utter reverence. Anxiety and curiosity played on his face; traces of fear were in his eyes. drive the empty chariot to reach here as quickly as possible." "Stop it!" roared Rama. He came near Laksmana, embraced him, lifted his tearful face, and with a rare seriousness looked deep into his eyes and said in a sort, penetrating voice, "If you say anything more, you will be murdering me here and now. It was not easy for me to come to this decision, but it has to be done. You go and do what I want you to do and come back soon." Weeping silently, wondering at the cruelty in his brother's harsh command, Laksmana left. Later, after performing his painful duty, a confused Laksmana returned to the palace. Shattered within, confused in his thinking, desperate in the contradictory emotions surging within him, he felt totally broken down and was drowning in his own dejection and despair. Days passed. One day, hesitantly, Laksmana approached Rama while he was sitting alone. 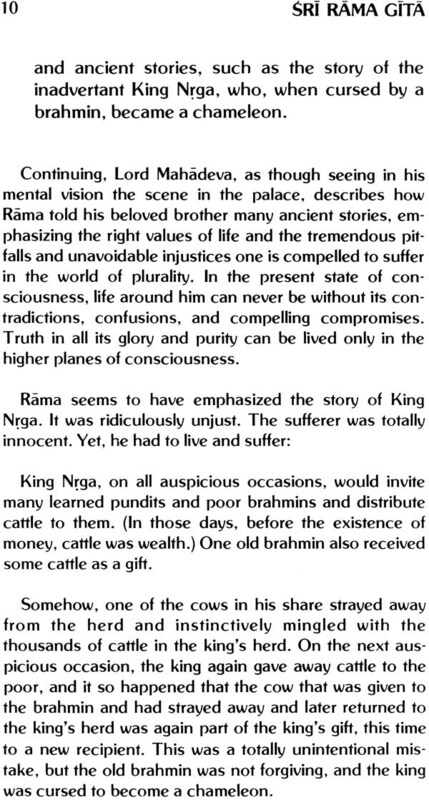 He asked Rama about the morality  the beauty and ugliness  that is inherent in all actions that man can and does undertake. The exhaustive discourse given out by Sri Rama, the perfect mystic, in response to his dear brother's question is called Sri Rama Gita. 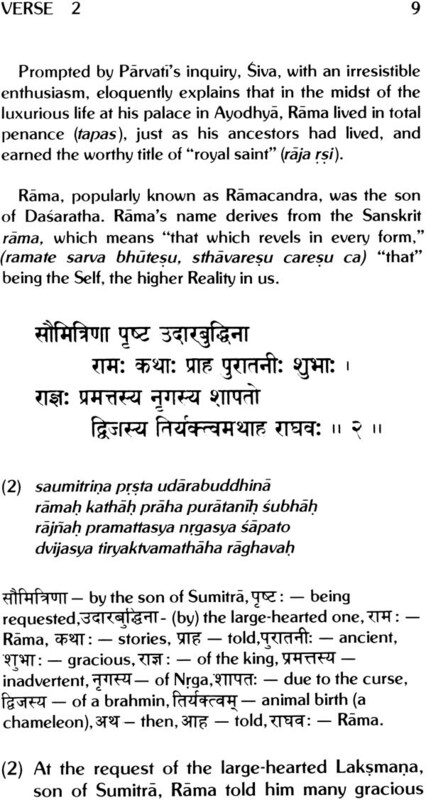 These sixty-two verses of Sri Rama Gita are found in Veda Vyasa's Adhyatma Ramayana, in the Uttarakanda, as its fifth chapter. It is conceived in the literary style called Pauranic. The text, popularly known as Sri Rama Gita, is also often described as Sruti-sara-sangraha, a brief summary of the very essence of all the Vedas. Sri Rama Gita is a truly authentic exposition of Vedanta. 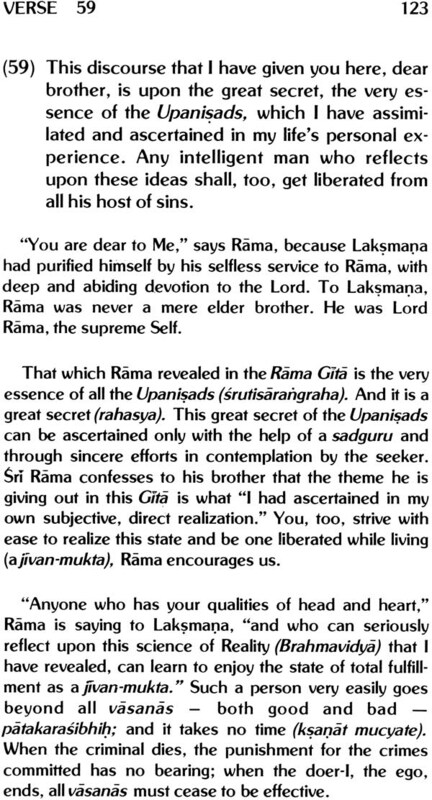 Implicitly following his usual technique, so familiar in the Bhagavad Gita, Vyasa puts this poem into the mouth of Sri Ramacandra himself; Laksmana, who had purified his personality through years of selfless service to his divinely righteous brother, is the disciple listening to Sri Rama's words. Reality is most ancient because the world of things and beings came from Him alone. Thus, he, the Father of the Universe, is more ancient than time. This "ancient Purusa" is the theme of all scriptures, including Sri Rama Gita. 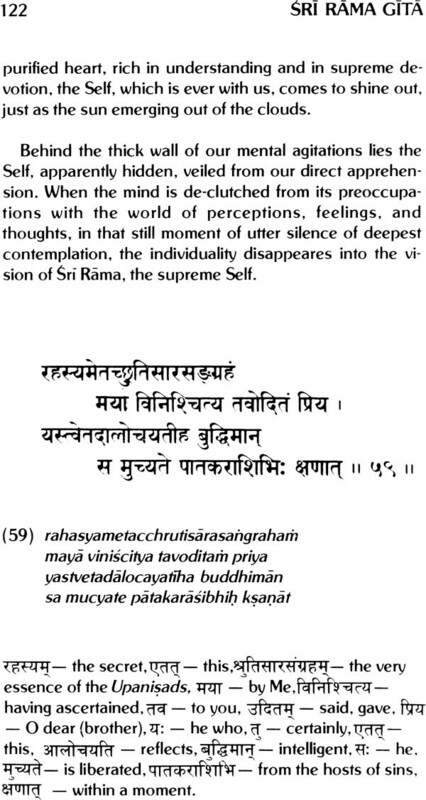 In it, Sri Rama talks about this eternal, timeless Essence in all of us, the Self. The sanctity of the text, the thoroughness of the delivery, the depth of suggestion, and the sublimity of the goal pointed out are all rendered valid and eloquently clear because of the spiritual perfection in Sri Rama, the teacher, and the glorious personality of his lifelong devotee, Laksmana, the disciple. The style of the Puranas is to relate philosophical truths through the vehicle of stories, telescoped one into the other. In Sri Rama Gita, Parvati, the consort of Siva, requests him to describe what happened to Sri Rama after he had banished his pregnant and innocent queen, Sita. Thus, we are not privileged to listen directly to the divine discourse of Sri Rama as he gave it out to Laksmana. Instead. We hear this Rama Laksmana discussion through the words through the words of Lord Paramesvara as he reports it to his inquisitive consort, Mother Paramesvari. This reminds us of the Vyasa technique in the Bhagavad Gita, where we hear the Krsna-Arjuna discussions through the words of Sanjaya.